For Longer Tire Life, Reduce Negative Camber. See if this sounds familiar… As you pass by your BMW or MINI, checking out the smart lines of the body, the tires look just fine to you. And when you clean the wheels and the tires, or add some air, the tread blocks look nice and deep. Then just a short time later, you are under the car and discover with some amazement and disbelief (or you are told by a technician) that the tires need to be replaced – to the tune of several hundred dollars – because the insides of the tires are completely bald! (See Fig. 1.) How can this be? You’ve driven only a few thousand miles on them, or had them on the car for just a couple of seasons of use… and the outside tread looks almost new! Welcome to the world of negative camber. The suspension on our BMWs and MINIs is designed to deliver comfort, performance, safety and economy. These four considerations do not always make good bedfellows, and the chassis designers must compromise on one or more of these goals. For example, comfort and performance require lightweight suspension components (in comparison to chassis weight). This results in a trade-off in long-term durability plus sensitivity to issues that can cause vibrations. Similarly, designing for performance requires suspension geometry and alignment specifications that may cause accelerated wear on components – not the best for economy. Our BMWs and MINIs are designed to be comfortable and safe at high speeds on unrestricted highways, tricky mountain roads and those beautiful, country two-lanes that point to destinations yet unknown. To be safe in all of these scenarios, the chassis and suspension must be designed primarily for performance. This is accomplished through the suspension geometry design (how the suspension parts move as the suspension is compressed and extended) and the wheel alignment. What is wheel alignment? It is how the wheel/tire and the suspension members are sitting when the vehicle is at rest. There are three main elements in alignment – Toe, Caster and Camber, explained below. 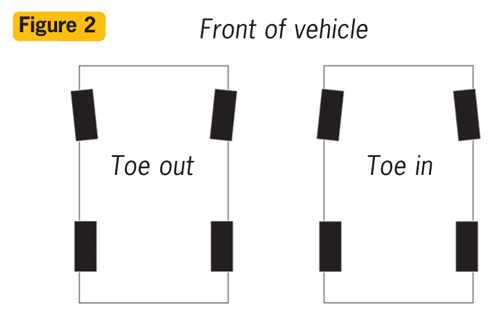 Toe: This is the angle that the front and/or rear wheels have, when looking from above (Fig. 2). Like looking down at your feet, your toes are toward the front. If the toes of your feet are further apart than your heels, you are “toe out.” If your toes are closer together than your heels, you are “toe in.” Thus, if the fronts of the front wheels/tires are farther apart than the rear of the tires, this is called toe out, and if the fronts of the tires are closer together than the rears, this is toe in. Caster: Caster, which is measured in degrees, is essentially the angle between 0° vertical and the inclination of the strut when viewed from the side of the car (Fig. 3). If the strut is perfectly vertical, that would be zero degrees caster. If the strut is tilted toward the front of the car, the caster is negative. If the strut is tilted toward the rear, it is positive. A caster angle that is too far negative can make the steering feel light; too positive and it can feel heavy. Properly adjusted caster allows improved high-speed directional stability, better steering response, quicker turn-in, reduced “dive” on braking and reduced “lift” on acceleration. Camber: This is the angle that the wheels/tires make when viewed from the front or rear of the car. If the wheel/tire is perfectly vertical it has zeros degrees of camber. If the top of the wheel/tire tilts outward, this is positive camber. If the top of the wheel/tire tilts inward (toward the center of the vehicle), this is negative camber. Too much negative camber causes the inside of the tire to wear much faster than the outside. This is especially true on BMWs and MINIs which come from the factory with comparatively high negative camber for better control at high speeds. In this case, economy had been compromised – you have to replace your expensive tires more often. This is especially true of BMWs and MINIs that have been lowered (Fig 4) and/or have plus-size wheels and tires. 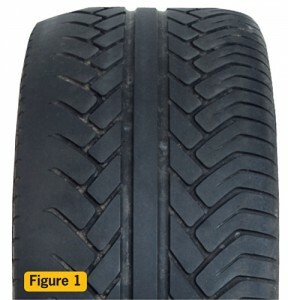 What can be done to prolong tire life? 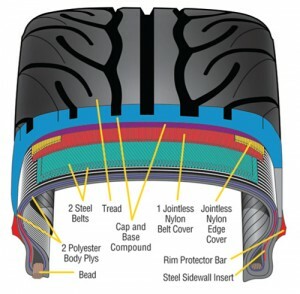 In the Winter 2009-2010 issue of Fast Times (www.BavAuto.com/newsletter), we discussed several simple things you can do, including checking tire pressure regularly and rotating the tires. But you can also alter the factory camber specifications to reduce the negative camber. The solution? We offer adjustable bushing mounts and/or control arms that allow you to change the camber. While these kits are considered “bolt-on,” installation does require raising the car off the ground and some repair experience is recommended. (Or you can have your technician install them.) These adjustable camber kits cost around $300–350 – about the same as a pair of new tires – so they will pay for themselves in no time. To give your Return On Investment a head start, we’ll take 10% off any camber kit purchased during the month of April. Above: adjustable rear camber arms. Left: Front and rear adjustable camber kits. Another weapon in the fight against negative camber: the design of Yokohama Advan tires. In addition to proper inflation, tire rotation, proper alignment and camber correction, we do have another option in the war against uneven tire wear. A few tire manufacturers have designed some of their ultra-high performance (UHP) tires specifically to compensate for excessive negative camber without quickly chewing off the inner tread areas. A good example of this is the Yokohama ADVAN line of tires, where the sidewall has been designed in such a way that it does not compress and distort under the uneven inner loading of the negative camber caused by performance suspensions. This does not completely eliminate the accelerated inner tread wear – it simply reduces the difference in wear between the inner and outer tread blocks so you get more useful tread life. 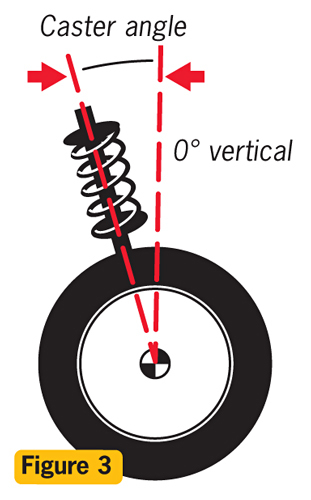 The camber angle identifies how far the tire slants away from vertical when viewed directly from the front or back of the vehicle.Camber is expressed in degrees and is said to be negative when the top of the tire tilts inward toward the center of the vehicle and positive when the top leans away from the center of the vehicle.If the vehicle encounters a bump that only causes one tire to lose some of its grip,the other tire’s negative camber will push the vehicle in the direction of the tire that lost grip.